'Adopting Haiti' documentary examines efforts to rescue orphans from the quake-ravaged country. (CNN) -- In the middle of a snowstorm nearly a year ago, a planeload of 54 Haitian children landed in Pennsylvania as part of an airlift of orphans stranded by the powerful earthquake that devastated their country. They were taken to Pittsburgh's Holy Family Institute, where they were thrilled by the flush toilets, running water and plentiful food, said the institute's president and CEO, Sister Linda Yankoski. Their stay at the facility for troubled or abused children was supposed to be temporary, just until U.S. adoptive families took them in, she said. Wednesday is the first anniversary of the Haiti quake, and by now most of those children have moved into adoptive homes, as have hundreds of others around the country who arrived in similar airlifts. But some spent months in federal custody -- several even experiencing their second winter in shelters in Pennsylvania and Florida, still waiting for their lives in America to truly begin. "They are confused, they feel rejected, they wonder what's going to happen to them and whether they are ever going to be with a family as they were promised," said Michelle Abarca, a lawyer with the Florida Immigrant Advocacy Center, which is representing some of the children who were taken to Miami. "They faced rejection in Haiti, rejection here. It's all rejection." The children's complex legal status unfolded because they were airlifted out of Haiti in the midst of a crisis, believed to be orphans in the process of being adopted by U.S. parents. The plan was to finish the adoptions in the United States, an unusual exception to international adoption protocol. I'm not sure what their crime was, but they've been in jail for a year. But once the children were in the United States, it quickly became clear not all of them were orphans already matched with U.S. families. Even for those who were, completing adoptions from so far away had obstacles. "I believe it was done with the best of intentions," said Cheryl Little, director of the Florida Immigrant Advocacy Center. "But we are challenged as never before to determine what's in the best interests of the child." The airlifts were a humanitarian gesture prompted by an outcry over conditions at Haitian orphanages after the earthquake. The 54 children taken to Holy Family were typical -- they had been stranded at the BRESMA Orphanage in Haiti's capital, Port au Prince, where two sisters from Pittsburgh, Jamie and Ali McMutrie, work as volunteers. Using social media, the sisters told dramatic stories of babies exposed to the elements, being rocked by aftershocks, living without food and water. Pennsylvania Gov. Edward G. Rendell heard the appeal and enlisted the Obama administration to help airlift the children to Pittsburgh. In all, the United States granted 1,090 children, including the 54 in Pittsburgh, what it calls "humanitarian parole," effectively permission to enter and stay in the United States on special visas while their U.S. adoptive parents complete the paperwork here, rather than abroad as is usually required. "Massive deaths, that's what would have happened if they had not gotten humanitarian parole," said Diana Boni, director of All Blessing International, the adoption agency that works with the BRESMA orphanage. A few adoptions have failed, and some children's permanent placements are still unclear. "I would estimate that about 50 percent of the children (who) were airlifted out ... would have died. All the agencies were struggling to even get food to children in all the orphanages." About 400 children immediately moved in with U.S. families trying to adopt them, said Jeffrey Kelley, spokesman for the U.S. Department of Health and Human Services. But HHS ended up with custody of another 660 children as their complicated legal situation was sorted out. They were placed in foster homes or shelters used for children who enter the country illegally. • Some children did not have firm commitments from U.S. adoptive parents. • In about a dozen cases, the U.S. adoptive parents changed their minds and returned the children to shelters. • In other cases, the biological parents in Haiti had not finished paperwork declaring they were giving up their children for adoption, or the paperwork was missing. • The Haitian government slowed the adoption process further after one group of Americans was arrested for trying to illegally depart the country with children. Eventually, one by one, all but 15 of the children moved in with families. In the case of the 54 who arrived in Pittsburgh that snowy night, HHS contracted with Holy Family Institute to care for them. In turn, Holy Family hired staff who spoke Creole and arranged trauma counseling for the children, along with weekly phone calls to their biological families, Yankoski said. The children began to go to school and learn English as they waited, living in a 5,000-square-foot home segregated from the delinquent children who usually make up the institute's population. At first, the adoptions moved quickly, but 12 were still at Holy Family for Christmas. We believe that the program implemented protected both the children and the integrity of the adoption process. "In the context of crisis and chaos on the ground, 12 of the children who came to the U.S. had not been matched with prospective adoptive families prior to the earthquake and the wishes of the birth families were unclear," said Sharon Parrott, human services policy counselor to the HHS secretary. "To safeguard these children, the government of Haiti, in collaboration with the United States government, identified and spoke with each of the birth families that could be located. "When it was established that the birth families wanted the children matched with adoptive families in the U.S., HHS worked with the Holy Family Institute ... to identify families that could best meet the needs of each individual child." The number of children at Holy Family dwindled to five just last week as children were matched with U.S. families cleared for adoption. Another 10 children remain in custody in Florida, either in foster homes or shelters where children who enter the country illegally are usually detained. "Given the situation (in Haiti) and what was happening on the ground, people did the best they could at the time," said Yankoski, adding that she believes the time spent at Holy Family has allowed the children there to adjust to American life. "They will be better suited for adoption after this slow transition," she said, noting that the children have open adoptions that allow for contact with their birth parents. Boni, of the All Blessing International adoption agency, credits federal agencies for their swift and effective rescue effort, but she is critical of what happened in the small number of cases where the adoption process hit snags. "Some of the BRESMA kids were brought in prematurely, before the humanitarian parole program had been established, their paperwork was not here when they arrived ... the obstacles they faced here were all bureaucratic," she said. Also, Boni said, the shelters are "very inappropriate places for these kids" because they were designed to house children with illegal immigration or social issues for short periods of time. "I'm not sure what their crime was," she said of the Haitian children still in custody, "but they've been in jail for a year." Given the situation [in Haiti] and what has happening on the ground, people did the best they could at the time. The government has defended its handling of the children, telling CNN the shelters provided the children with "excellent" care, including therapy for their trauma. "We believe that the program implemented protected both the children and the integrity of the adoption process," said Parrot of HHS. "The program resulted in more than 1,000 children being united with their adoptive families in the United States." In 2009, the year before the quake, the U.S. State Department processed 330 adoptions from Haiti. The earthquake prompted the government to open the door to hundreds more, in some cases reducing to weeks what can be a four-year process. In a report being released on the quake anniversary, the Florida Immigration Advocacy Center spotlights the difficulty in making sure adoptions are legitimate and in the children's best interests when they are rushed. "Given the emergency nature of their evacuation from Haiti, some children were brought without proper entry documents or evidence of the ongoing adoption process begun in Haiti," the report said. "A few adoptions have failed, and some children's permanent placements are still unclear." The report also describes children who were taken out in medical evacuations, never intended for adoption, but nonetheless in the United States now with no parents to care for them. It tells the story of 3-year-old Christina, who was rescued from the earthquake's rubble, and 5-year-old Odette, who was crushed in the collapse of her school. They were treated at U.S. hospitals after being evacuated, then detained in federal shelters upon release. In cases like theirs, the advocacy center wants the U.S. government to grant their parents visas to come to the United States and join them. Meanwhile, HHS is continuing to house and provide medical care for them at its shelters. More than 50 Haitian children were airlifted to Pittsburgh in late January 2010. The airlifts also raised issues for U.S. families who launched emotional campaigns to get the children they were adopting to safety. These parents had to finish the adoptions from long distances, dealing with a country in crisis. Usually, children adopted abroad enter the United States holding U.S. passports as the children of U.S. citizens. The Haitian refugee children arrived as Haitian citizens, ineligible for U.S. citizenship until they lived with U.S. families for at least two years. If they turned 18 before that time was up, they would lose the opportunity to gain U.S. citizenship. In December, President Obama signed the Help Haiti Act, which puts the Haitian children on equal footing with other children adopted abroad. The airlifts were criticized even as they were happening. They were described as "hasty" by international child advocacy groups like Save the Children, which said that the "adoptions would risk permanently breaking up families, causing long-term damage to already vulnerable children, and could distract from aid efforts in Haiti." Haiti had an estimated 350,000 orphans before the earthquake and as many as 1 million afterward, according to Haitian government estimates. Many had parents unable to care for them but not willing to permanently relinquish them, according to UNICEF, the United Nations Children's Fund, which raised concerns at the time that child traffickers might pray on this vulnerable population. HHS' Parrott said it was an "extraordinary" program undertaken in the best interests of the children. "The program was limited in scope and designed to ensure that every effort was made to verify documentation and mitigate the risk of anyone taking advantage of the system to improperly remove children from Haiti," she said. The concerns raised by international child advocates met headlong with the compelling stories of desperation and danger coming out of Haiti that captured the attention of the media and political leaders. At the Haiti orphanage Maison des Enfants des Dieu, 135 children were languishing in high temperatures without clean food or water while U.S. adoptive parents pressured their government to help them get the children out. Valencia, one of the orphans on a harrowing bus ride, was at risk of dying from heat exhaustion. Their plight is chronicled in "Adopting Haiti," a documentary by independent filmmaker Timothy Wolfer being released on the quake anniversary. It tells the story of how the children were taken on a harrowing bus ride from Maison to the U.S. Embassy amid fears some children might perish in the heat. The bus was turned back because the U.S. government had not yet authorized the airlifts. The documentary tells how media attention, including that of CNN, helped persuade U.S. officials to act. The documentary features both the biological and adoptive parents of one girl, who describe the painful separation process of the adoption. Adoptive parents call the airlifts a great success. The Maison children included a boy whose adoptive mother, Kim Harmon, is director of For His Glory, the U.S. adoption agency that runs Maison. "We just finalized our adoption last week for our son, Benjamin Jhonsley Harmon," she told CNN in a recent e-mail. "Ben fits right in, and it is as if he were always a part of our family. He is a typical boy full of life and energy." 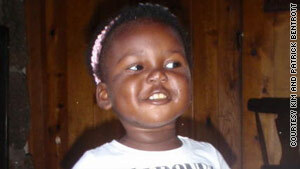 A recent image of Valencia, 15 pounds heavier than when she left Haiti, living with her adoptive parents in Colorado. Another of the children on that harrowing bus ride, Valencia, was at risk of dying from heat exhaustion. A year later, her adoptive parents have a picture of her on their website, 15 pounds heavier and living with them in Denver, Colorado. In Haiti, the number of children in need of new homes continues to grow, and the United States has reopened the door to new adoptions. The Maison des Enfants de Dieu orphanage featured in "Adopting Haiti" has filled up again with children destined for U.S. adoptions, this time to be completed in Haiti. The McMutrie sisters returned to Haiti in August to help families find ways to keep their children, but already they are caring for seven newly orphaned toddlers. "We can't wait to see the kids growing and thriving in their new homes, and, like all the children we lived with and continue to live with in Haiti, we will love them and be connected with them for their entire lives," the McMutrie sisters told CNN by e-mail from Haiti. Back in Pittsburgh, Yankoski said the situation reminds her of U.S. orphanages at the turn of the last century, when parents left children because they had no means, not because they didn't want them. The difference is the Haitian children also have suffered the trauma of an earthquake destroying their home, lived through an emergency airlift to a foreign land and spent a year in an institution. "It's really a shame, because most of these families turn the children over because they need support and can't feed them. I can't imagine any of these families wanting to give them away. There needs to be a different system, but there isn't, so at least these kids have a way to a better life," she said. The children still at Holy Family often ask their parents by phone if they have anything to eat or places to live, expressing concern over the families they've left behind. "It's quite heartbreaking," Yankoski said. "In the long run, the children are going to grow up and want to know why they are here and how did they get here and where is their own home and their own parents," she said. "This is a good solution, it's not a complete solution. But it's a solution for now and I can understand why their parents would have chosen it given what they were facing." CNN's Alsye Shorland contributed to this report.